Give Raleigh Pool Table Movers ABIA a call and get a quote for your pool table refelting appointment. Did you know that you don’t have to change out your current cloth when you move your pool table? It happens to be the best time but it’s not necessary. We offer over 30 different colors and two different materials to choose from. Why use a professional pool table refelting service? The process of pool table refelting and pool table installations should be done by a professional recovering service like ours. We have all of the necessary tools and equipment to get your pool table complete. When we’re all finished you’re all ready and playing pool with your new billiard felt. 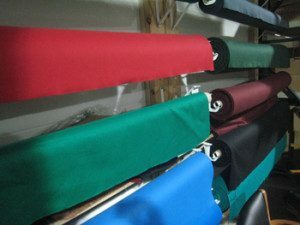 You can choose from a list of colors for three lines of cloth that we supply to our customers. There are differences between standard cloth and upgraded worsted material. The worsted material is manufactured differently and rather than having the fuzzy finish it is very smooth and durable. The worsted felts play much faster and give the player a more responsive and different gaming experience. You can order your pool table refelting in either material. Pricing fluctuates in the area depending on what material you choose and what type of pool table you have. We’ll need all of those details to get you an accurate price to recover your pool table. Stain resistant material. Woolen felt is what is most commonly found on pool tables and is most commonly what is offered with all new pool tables. The texture is a little “fuzzy” and is the slowest of the materials which makes it also the most economical of the options. At Raleigh Pool Table Movers we guarantee all of our work, this guarantee is issued by the American Billiard Installers Association. All of our pool table moves are guaranteed for an entire year, not just by a verbal or small company guarantee but a national organization. Raleigh Pool Table Movers can take care of all your pool table needs. Make sure you check your room size before you decide what size pool table to purchase.